A brand association map is designed to visually shown the connections to a particular brand. Generally we look at the attributes, attitudes and images that the brand is associated with, but we are also able to consider non-associated aspects and even review how our competitors sit relative to these same associations. 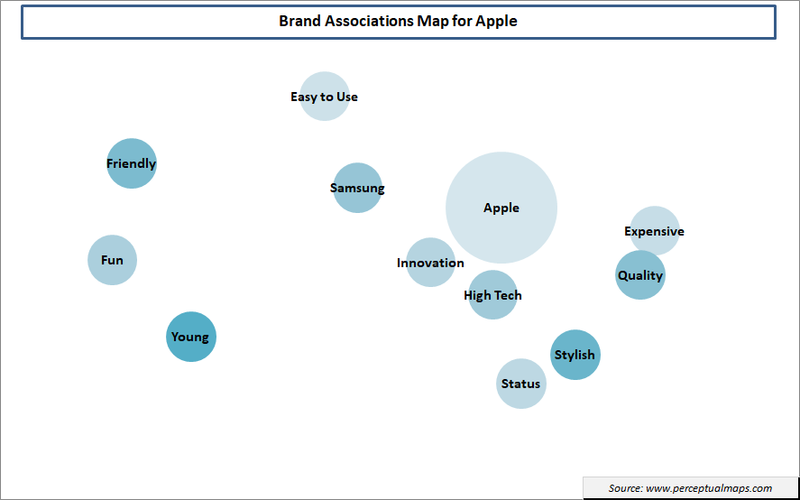 As you can see from the above brand map, Apple is strongly associated with “innovation” and “high-tech” as they are the closest to the Apple circle, whereas (in this example), they are these directly associated with terms further away, such as “fun” and “young”. But this does not mean that Apple is NOT associated with this aspects – instead they are MORE strongly associated with the attributes and attitude statements that are closer to them on the brand map. You can also see that “Easy to Use” is positioned away from Apple and slightly closer to Samsung. To make sense of this on the brand map, we need to understand what the map is designed to do. In this case, Samsung is less directly associated with (as compared to Apple) with many of the attributes on the map. Both brands have products that are easy to use, but Samsung (being weaker on some of the other statements) has “easy to use” as one of its stronger associations – as compared to Apple who is the strongest for “innovation” and “high-tech”.